﻿ Country Arts & Jewelry - Ohio. Find It Here. 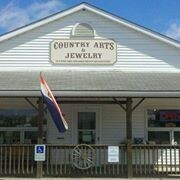 Country Arts & Jewelry is the best place to find beautiful Southwest home décor, accessories and jewelry. Our products have an unexpected pastoral quality that make lovely and unique additions to your home or wardrobe, wherever you may be.Our Native American artifacts and jewelry are completely authentic and made from actual Native American tribes and reservations. More than just being a form of tribal fashion, our collection of Native American jewelry is genuine and original. Each piece is 100% handmade and unique  meaning theres only one of its kind out there! And the same goes for our lovely pottery pieces. With intricate handmade and hand painted details, the Mata Ortiz pottery line will give any home a traditional, rustic touch.While our products make great decorative pieces, some of them also hold spiritual value and application. Native American culture embraces spirituality in nature and the inner-being, and many of our metaphysical supplies, like crystals, reflect that. They can aid in your meditation and relaxation or even chakra and energy healing.